So as I mentioned yesterday now the Stormcast Eternals have been completed my focus has moved to the Sylvaneth. 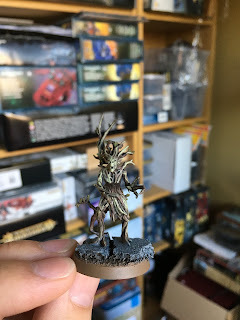 I realised at Bristol Smash that needed more troops for my army and had the Forest Spirit Warhost box (3 x Treemen, 32 x Dryads and 1 x Branchwraith) sitting neglected in the man cave, this seemed like the obvious option to go down rather than buying more Stormcast. 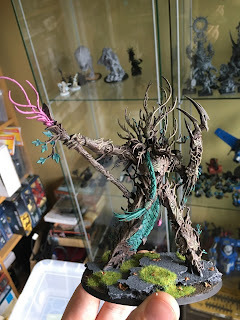 I've always been a fan of the Sylvaneth, the treeman plastic kit is one of the best kits that Games Workshop has released in recent years, it's absolutely stunning and the different poses you can have really give each Treeman character. 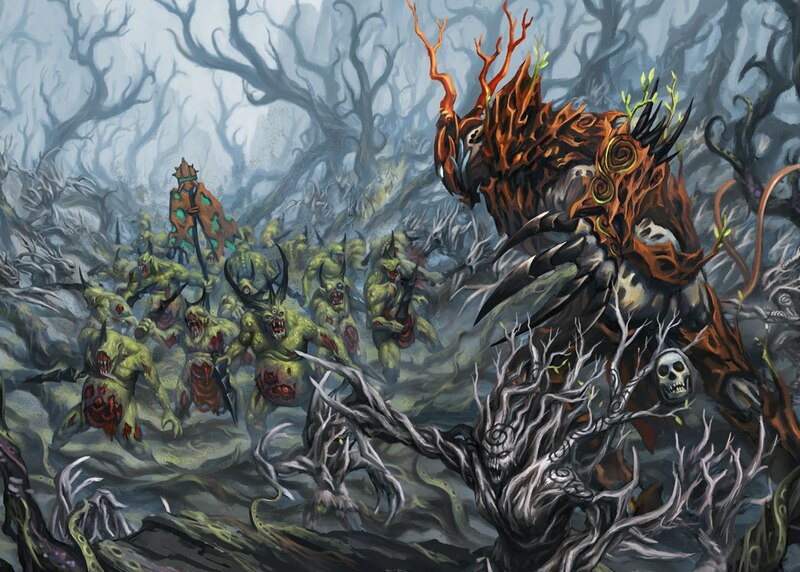 It would seem my timing is rather impeccable with the preorders for the Sylvaneth Battletome and new beautiful models going live on Saturday. I've had a good chunk of money put aside for a while now with the whole intention of spending it on a new army launch that peaked my interests. Safe to say that money is being spent completely on the new models this week! Painting the Sylvaneth I wanted a scheme which was easy to produce but looked quite striking on the table. I knew already that my basing would tie in with the Stormcast with the cork bases, grass and autumn leaves, I wanted to be able to mix the armies together if needs be; there's nothing worse than having a combined factions under one Grand Alliance and the bases are all different, it just makes the army look un-cohesive. Originally I basecoated the Dyrads with Dryad Bark, overbrushed quite heavily with Gothor Brown and then drybrushed on the raised areas with Baneblade Brown. They looked ok, but in a bit unit they kind of got lost. It was hard to distinguish between the models as frankly they were just different shades of brown. I had a play around with some different colours on a test model, I thought if I could find one colour that makes the models pop then I could use it across the army. I first tried different oranges but they were swallowed up by the browns I had used. Randomly I picked up Nurgling Green, I’d just finished using it on something else and tried a small area and instantly it made a massive difference! I then proceeded to pick out just the runes on the Dryads with it, they looked ok but it was still lacking an overall ‘pop’. That’s when I decided to drybrush the whole model with it, instantly I knew I’d found my paint scheme. With this step I didn’t need to add the Baneblade Brown and it was relatively fast to paint up 32 Dryads using this scheme. 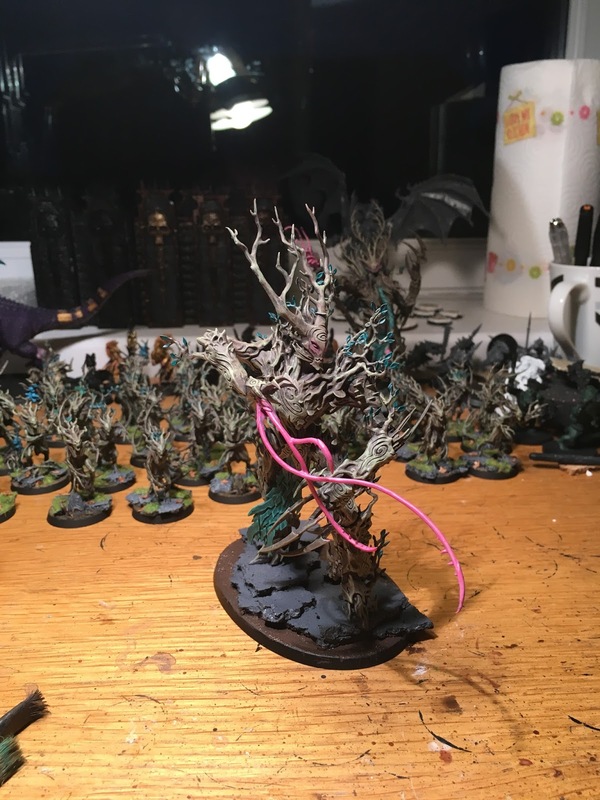 I did want the teal colour that I used with my Stormcast to tie in with the Dryads, for this I picked out the leaves for that colour. Start with Incubi darkness as the basecoat, followed by Kabalite Green leaving the Incubi in the depths then drybrush on the highest areas with Sybarite Green, with the Treemen and the Dryads having so many raised areas these are the ideal models for this approach. Overall I’m really pleased with this scheme, getting these all painted up over the last couple of weeks have been really easy to do but as an army looks really effective. I’ve replicated the paint scheme with the two treemen I’ve painted up so far and they look great. I added some pink into their models for the vines and eyes just to break up the overall model. 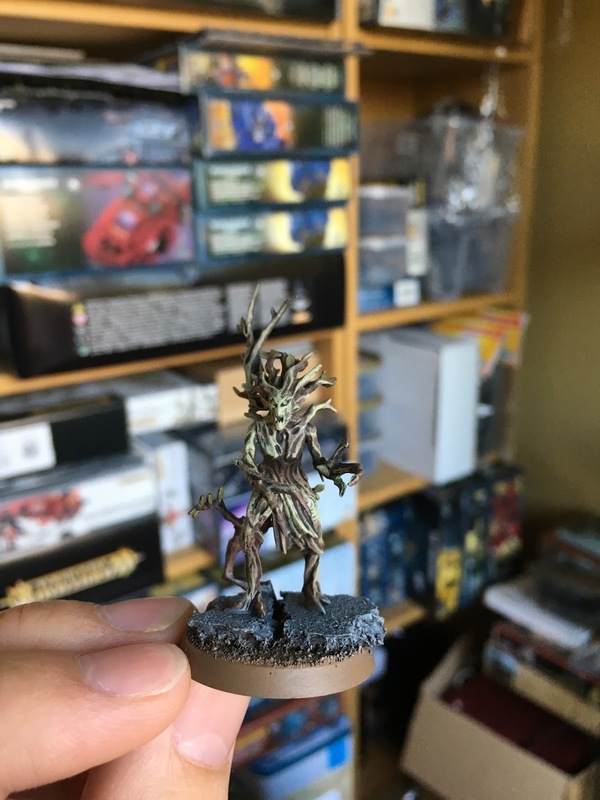 Now to get the Spirit of Durthu painted up ahead of the release of Battletome Sylvaneth, the Drycha, Tree Revenants, Kurnoth Hunters and most importantly Alarielle The Everqueen next week! Well what a busy couple of months! In case you've missed it the first two episodes of the Tales of Sigmar podcast has been released. It's been a really fun time recording these and cannot wait to get more out on a more regular basis. 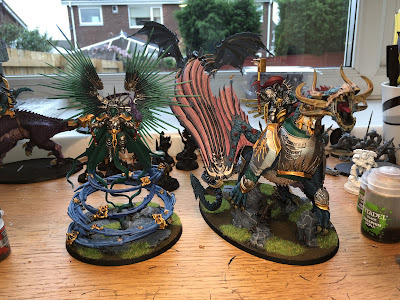 This month I've gone to two Age of Sigmar tournaments, the first was a weekend event in the form of Bristol Smash. Granted I got smashed all over the shop but I had a good laugh. The second event was this past weekend and on Sunday I participated in the 2nd Leeds Last Stand. For this event I took a mixed Stormcast and Sylvaneth list and surprisingly did very well coming 4th and picking up the Best Order trophy! So yes the Stormcast and my progress. Well I've managed to get the whole army finished to a tabletop standard and it's something I'm very happy with to have a fully painted army to play games with now. Ideally I could do with some more troops, maybe a couple of more Paladin units and maybe some of the Dracoth riders. 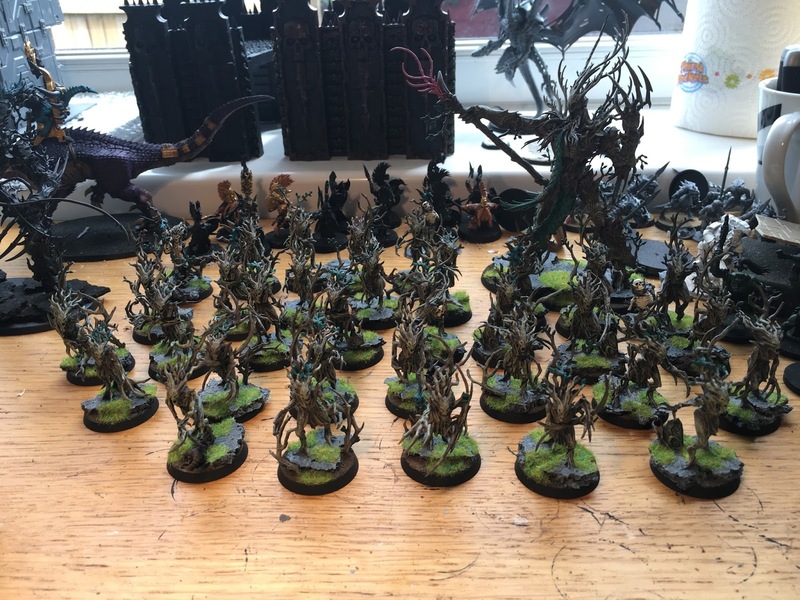 But all my attention for the next few months will be on the every-growing forces of Sylvaneth! 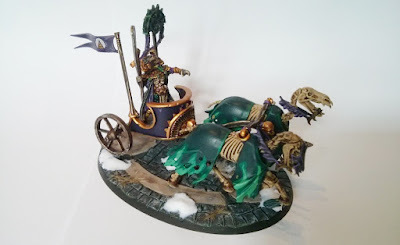 An expert hunter like the Knight-Venator was much needed to fight in the Realm of Beasts, and that almost sums up the Stormcast Heroes leading my warrior chamber (cf the "Lords of the Storm" warscroll battalion). Next month I'll have to decide if I want to fill my last "hero slot" with a Knight-Heraldor to have the full spectrum of heroes, or another Venator to insist on the "predatory" style of my chamber. We'll see. 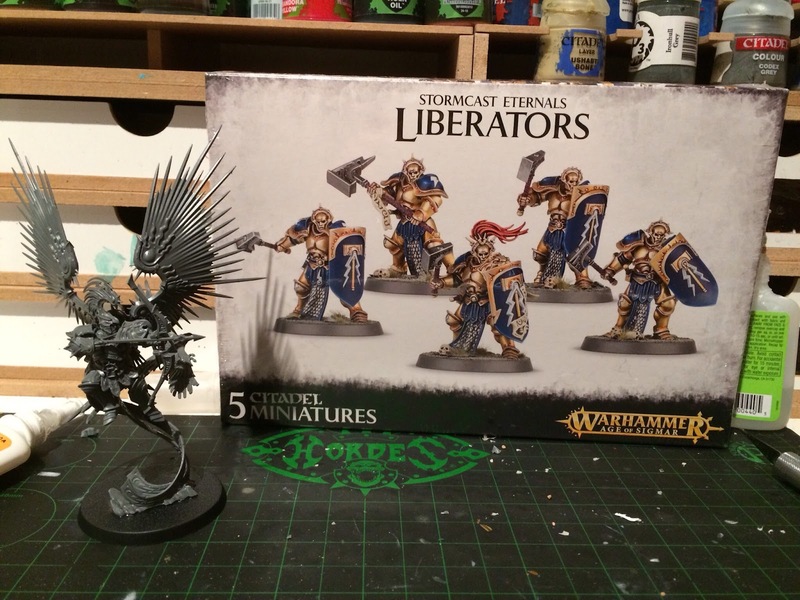 The Liberators will be assembled wielding two hammers each, it looks badasser and contributes to the aggressive style of these former bestial denizens. In the meantime, I didn't stay idle the past two weeks and finished my Ghur Baleful Realmgate ! I'm really happy with the result, the spare bird from my Venator set was the perfect thing to make this scenery unique and identify it to the adequate realm. A few beast skulls on the floor, brown grass and a whole Amber color scheme, and it was done ! 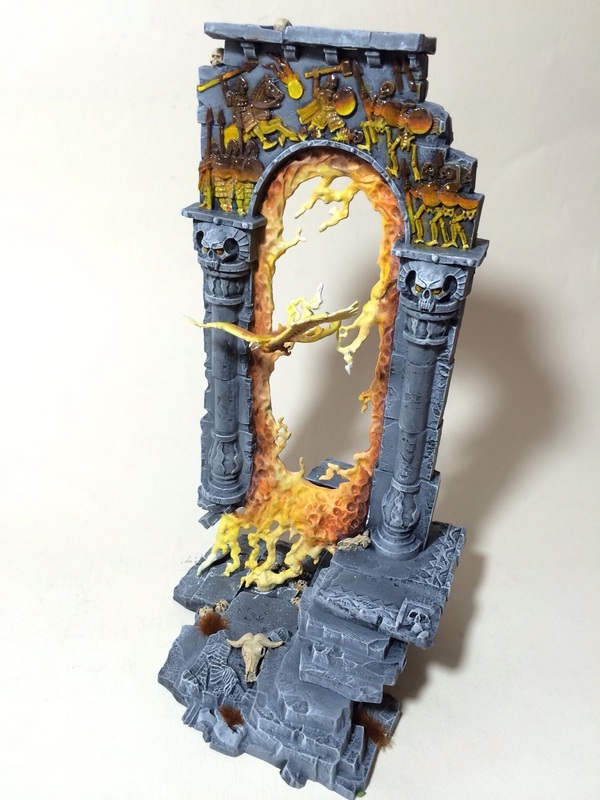 I can't wait to display it on a table filled with thematic scenery. More pics and comments on my Tumblr. See you in one month, have fun painting and playing ! 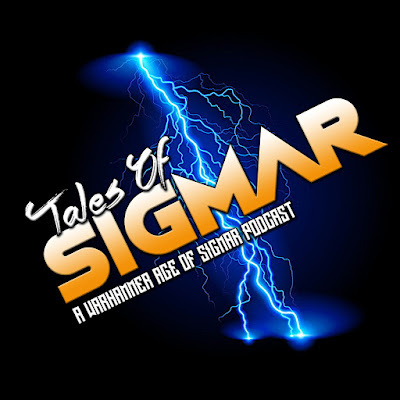 Welcome to episode 2 of a Tales of Sigmar the brand new Age of Sigmar podcast. In this episode we give our hobby updates, cover the Bristol Smash tournament Chalmers and Dan attended and also answer questions from the listeners. To me, playing is the biggest incentive to paint. I usually play only with fully-painted armies, which allows for an organic grow of my forces and battles. The more I play, the more I paint ! Unfortunately I didn't play a lot of AoS this year, and spent most of my time on Warmahordes, which looks like to be my "main game" for the next upcoming months. Therefore I'm still lagging behind my Tales of Sigmar schedule. I don't know if I'll catch up on my paintjob goals anytime soon, but I keep planning my monthly budget and add new troops to the mix. 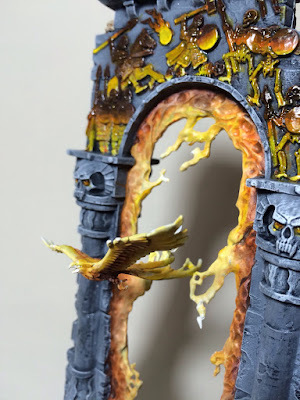 Even if I'm not keeping up like I thought I would, this awesome challenge makes me progress on my Stormcast Eternals, prepping them to be painted much faster once I'll be in the thick of things. It's much more than I would have done if I hadn't joined the Tales ! So here is how I spent last month's budget and the state of my forces still on the painting station. I finally finished the Knight-Vexillor and the Protectors, who look pretty cool to me. I have to work on their backstories know. I'm still brainstorming on the hero but I already know the Protector unit will be the Zweihänders, a former mercenary company who roamed the Realm of the Beasts, fighting with great two-handed swords, before being taken by Sigmar and reborn as Stormcasts. I try to keep a norse/german feeling to my Ghur warrior chamber, hence my choice of names. On the WIP side, the picture below says it all : I have started working on my Realmgate, and the other miniatures (Lord Castellant & Gryph-hound, Knight-Azyros, Judicators) are primed and ready to be painted ! I went for the Knight-Azyros rather than the Venator to cover the more protective and benevolent side of the Wardens of the Realms, but the beast-hunter theme is so fitting to Ghur that its twin will show up soon. It was also high time to add more ranged firepower to my army, so Judicators were a natural choice. I was more into the boltgun-crossbows design than the classic bows, and delivering a hail of fire at medium distance just after an opportunistic teleport just seemed right to me. So here we are, the army is growing and will soon have some June reinforcements ! Alas, poor Nagash, for I have not finished thee. and work was ever ceaseless. and repent the feeling of surprise. For the linen clad walkers were ever part of this humble host. And craved the touch of paint the most. Enough with the pleasantries. I've got three models for you all this month. First up is the Liche Priest, and ancient and venerable old model. It's a classic in many people's eyes. I don't think its all that. It's got some character, but it's very much a metal model. Flat, some giant detailing, arms raised up. I did enjoy painting it though, went very fast and smoothly. As a bonus, I also added a picture of my second Liche Priest, painted about 10 years ago. It has a layer of 'Ardcoat, but I think you can see the difference. Next up is the Tomb King on foot. Much better sculpt than the Liche Priest. Plenty of detail, evocative pose without being too generic, very regal feel. I actually started with Tomb Kings about 12 years ago. Couldn't paint, didn't play, but loved the aesthetic and the feel of the army. I eventually ditched it for Lizardmen and Ogres. 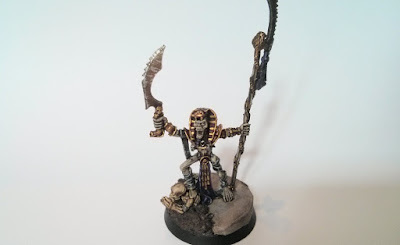 But part of starting this Death army was the chance to go back to all the stuff I loved about Tomb Kings and doing them properly. 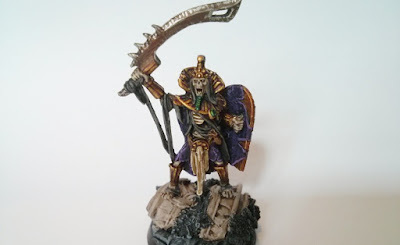 So now, more than a decade after I started in the hobby, I finally have a Tomb king! Turns out I have two! After finishing the above guy, I struggled to think who to paint next. Other than Nagash. This guy was just sitting there. 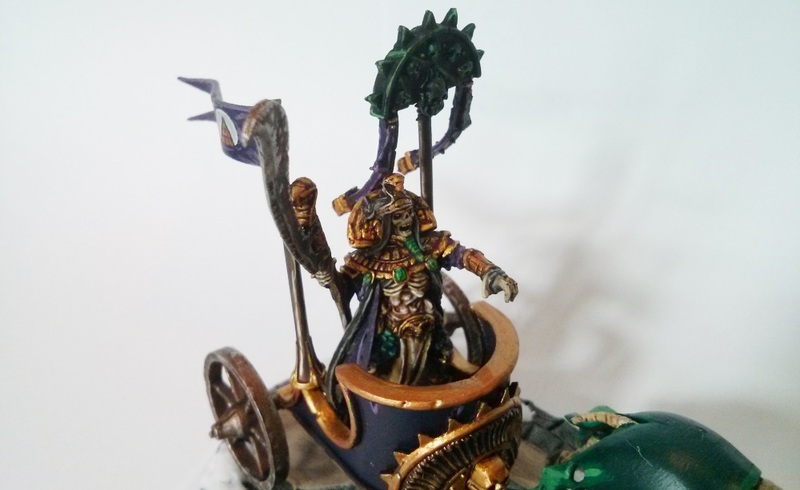 I already had plans for him and 6 more chariots, but I didn't know if my idea would work. Just had to put him together and see. 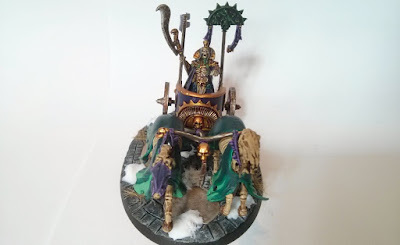 It is made up of Black Knight horses, TK chariot body, Dragon Prince lances, Tomb Guard banner and High Elf archer banner, with a regular Tomb King riding it. The horses are really the key part of this model. I never liked the original skeleton horses. They were just not very good sculpts and had terrible mould line issues. Adding the Black Knight horses both updates the look so it looks sleeker and more ornate, it also makes it fit better into the City of Silence aesthetic. The King himself is a regular TK on foot. Chopped off the tab and glued him in. I know there's a version of him with the blade pointing into the ground whilst he points, which I believe was the original "TK in chariot" model. Never did get that one though. So this guy had to do. He's got the weapon on the warscroll, so that fits. I also really enjoy the pointing. He emanates power. I can believe that his will alone makes entire armies march. Was a lot of fun to paint this model as well. I need to improve my gold, but I've settled for a nice scheme for now. That's all I finished for may! Hope you guys enjoyed it.